The Davey Tree Expert Company shares advice for having your best yard ever. Create a plan. Use these colder winter months to decide what changes your garden needs once spring arrives. Create a regular maintenance schedule to ensure trees, shrubs and flowers receive consistent, quality care. Make sure to include a diverse range of tree species in your plan. Trees and shrubs provide structure and drama to a garden. In addition, as trees grow, the cost-saving benefits they provide throughout the year increases significantly – the cooling shade in summer and the wind reduction in winter can reduce home energy bills by as much as 50 percent. Inspect trees and shrubs for insects or disease. Mature trees increase property value by as much as 28 percent, according to HouseLogic. But a tree can shift from asset to liability when branches, trunks or roots suffer injury and threaten to cause property or personal damage. Protect your family and home by inspecting trees and addressing potential problems now. Prune in the winter. Now is the best time to prune dead, diseased or broken branches to keep trees and shrubs structurally strong and able to withstand damage from severe weather events. Plan to use mulch. Mulch conserves water, inhibits weeds and provides an attractive ground cover. Spread a circle of mulch around trees to keep lawn mowers from damaging the roots and bark. Cover the drip-zone — areas directly beneath the foliage and shaded by the tree — with 1-3” of mulch and keep it 2-3" away from the trunk to discourage rot. Tree roots need to breathe, so don’t mulch too deeply – create a “donut” instead of a “volcano” of mulch. Resolve to be water-wise. One inch of rainfall equates to 625 gallons of water per 1,000 sq. ft., but we can’t always count on the rain. Be a water-wise gardener by watering trees and shrubs slowly once a week in the warmer seasons. Water only in the early morning when it’s cooler to avoid evaporation, mildew and rot. Remember tree roots are deeper than turf roots, so you need to water trees about three times as long as you water your lawn to make sure enough moisture reaches the root zone. It also helps to water only the drip zone. Want to add these garden resolutions to your list this New Year? 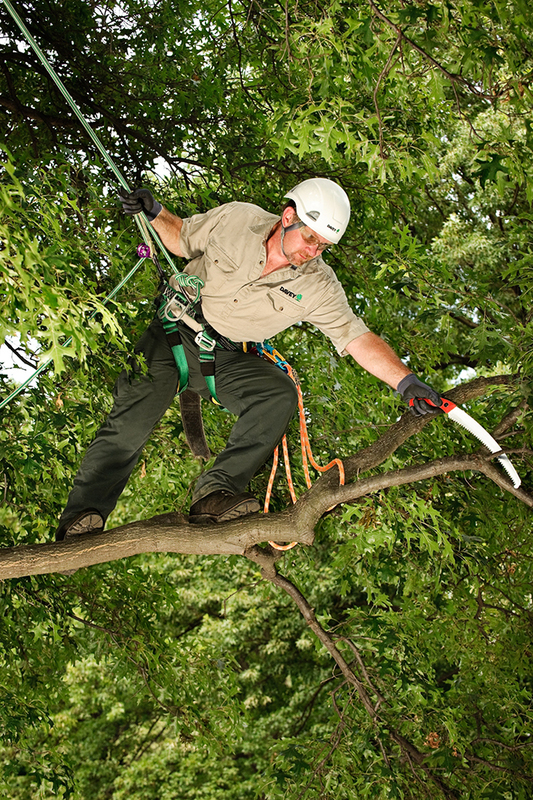 Call in the experts to inspect your trees this winter.